The French general election, is a crystallized reflection of the ravaging political crisis within the ruling classes and consequently its political-ideological elites in France and in rest of the (Western) Europe. : The “new” fraction is building a round of the so-called pro globalist, a “global state-governing structure”, of entire planet competing with “anti globalist”, a semi nationalist approach to deal with political economy, are in an internal deadly class struggle to defeat, and if possible to kill each other; all available means are allowed to finish off internal class competitions. From a socioeconomic view, neither fraction is able to resolve the problems related to the growth and profitability measurements in economics, that has disestablished the “world order”, as a whole, since emergence of the financial crisis in the main center of capitalism, the US in 2008. The non-disappearing impacts of crisis in economics, attached to the system’s inner core operation, i.e., the tendency of capital accumulation (production of surplus vale, transformation of surplus vale to capital…) towards a moment of nullification, before it returns back to full working state; massive destruction of already accumulated capital in the forms of constant and variable capital. Capitalism with total imperialist mode of operation has transformed the world to a unified production plant and distributing-consuming network, from Gaza in Palestine to Detroit in America carries capitalism’s transparent global logo and, at the same time, signs of general breakdown; crisis in every domain, including the planet Earth. Implication in this context is clear, sooner or later, the invisible force of the labor law of value has to synthesize the labor market, and so the labor cost on global level; The labor theory of value-with a globalized content-will conquer eventually capitalism’s final calculations in bookkeeping rules. This is the real point of attraction, politico calculus and differential equations for “neoliberalism-globalist vision of paving the way for a total free capital circulation on global scale, in parallel with the socio economic and political forced globalized procedure of labor power: How to align two main different living standards for proletarian class that exists between “North” and “South” (in main China, India… as reference point). Other imperialist network led by Russia and China, for the benefit and interest of their own state-capital composition are not sharing the vision of a “global state/governance” at the moment; Russia and China as a main imperialist force/network against this US and Europe led globalization of political-economic structures are well aware of imperialist aims of “western” globalization; total takeover of all markets including the capital-labor markets. Demolishing the rest of remainings in ”welfare state” (semi- safety network in social benefits, … for the proletariat in general and rest of the population that is related to labor-capital antagonist relation) is aimed to leveling labor cost differences between geographically and politically separate labor markets, derived from the present imperialist network allocations; China, Russia, India… on one pole and, in main, the old “West” capitalist center. “Globalism” overt or covert is an ideological umbrella for organizing all political forces of world state- capital compositions from the old political conservative formations to the left; from the large social Democrat parties to part of traditional Anarchism. In this context, an ideological commodity and societal-political artifact was crafted by French (and EU) capital-state establishment; Emmanuel Macron. Thus, the traditional election box entertainments charged with inter class imposed of ideological power struggles, which is in essence aiming at squeezing workers for voting; alienation related to self/class-deception. However, for workers and majority of population, it does not really matter, which fraction, Le pen or Macron (racism/anti-racism, Fascism/anti-fascism, “far-right”/”social-liberal”…) wins this duel. But the western state-capital structures, as an imperialist network (French, EU, part of US…) have decided to pull out Macron from the ballot box; for strengthening the “western” imperialist network, and taking over the global market shares from rival Russian/Chinese imperialist network. This means, the proletariat shall stand for the cheap labor power and, if necessary, blood for maintenance of the existing capitalist world order, which is not going to resolve the crisis, caused by the capitalist production system in setting up the ecological and social reproduction. Next post: On the French Election: No bosses, no nations! 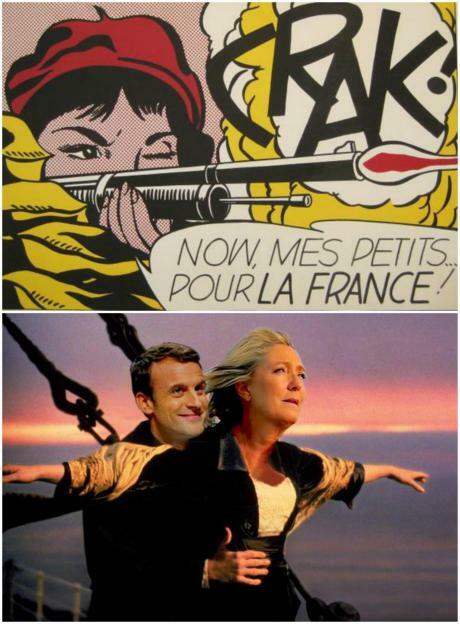 No Le Pen, no Macron! Victory for anti fascists! – No platform for far right AfD at #Oxford Union – Enough is Enough!